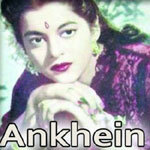 "Ankhen" is a 1950 hindi film which has Nalini Jaywant, Yashodhara Katju, Cuckoo, Bharat Bhushan, Yaqub, Anwari, Bhudo Advani and Shekhar in lead roles. We have 3 songs lyrics and 3 video songs of Ankhen. Madan Mohan has composed its music. Mukesh, Shamshad Begum and Meena Kapoor have sung these songs while Raja Mehdi Ali Khan has penned its lyrics.